2018 was a year rife with monstrous breakout performances around the league. Many a player took the next step towards superstardom, but we had to limit the list to 10. Here, in no particular order, are the guys that stood out above the rest. Simply put, Mahomes had the best breakout season of all time. 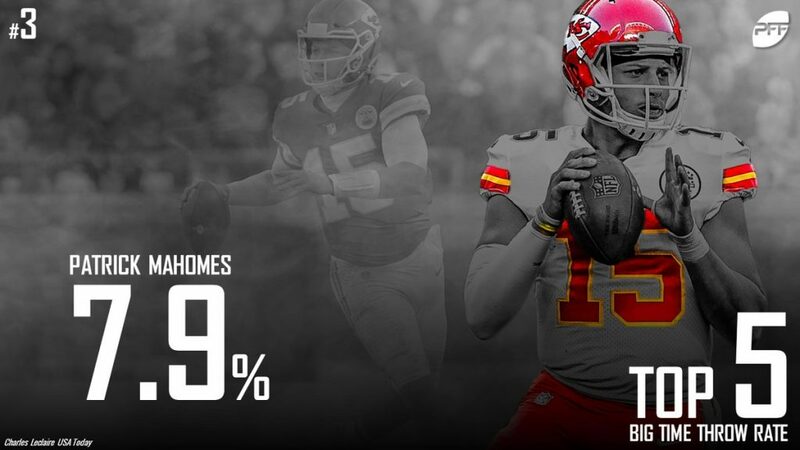 Mahomes racked up the eighth-most yards, second-most touchdowns, and eighth-best passer rating for a single season in NFL history. You don’t need a PFF grade to tell you how special he was. Others may have been statistically more impressive than Smith, but with all he had to overcome, no breakout was physically more impressive. In the 2017 preseason, his knee injury was visibly still an issue. Once Smith got up to speed in a straight line, he simply couldn’t turn or cut off the injured leg. The knee may never be 100%, but whatever percent it was this year was good enough to produce the seventh-ranked linebacker in the NFL. 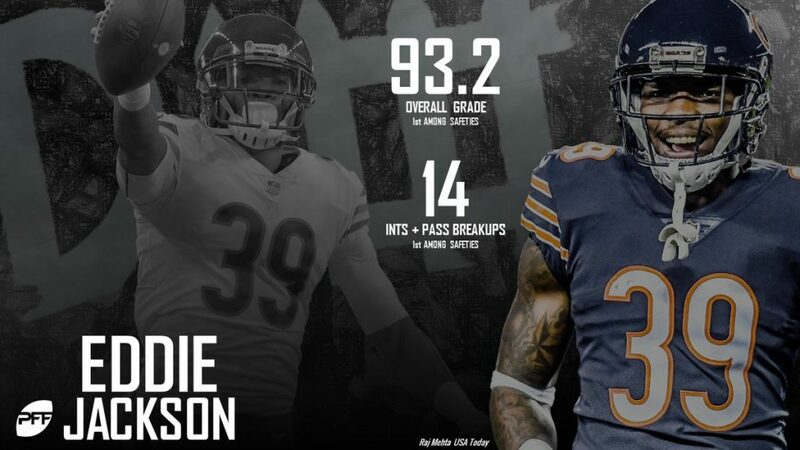 Jackson went from surprise starter as a rookie all the way to highest-graded safety in the NFL. While Mahomes’ rise was historical, Jackson’s was more surprising. He had six picks to lead all safeties, and eight pass breakups to also lead all safeties. Jones was a solid safety in Dallas, so the debate on whether this is a breakout season is fair game. Now though, he’s an elite corner. Even though he ended the year without an interception, it’s clear that Jones is one of the best in the game. He allowed only 481 yards in his coverage on only 37 catches. His 53.6% catch rate was among the best in the league. There were certainly flashes of dominant play as a rookie, but the consistency wasn’t quite there yet. Now though, Adams’ grade jumped from 68.5 last year to 89.7 this year, and he’s quite clearly one of the most dynamic weapons at the position. Any All-Pro ballot that didn’t include the Jets’ safety should be ashamed of themselves. Adams had been trending upward for quite some time, but he had still yet to put up a 1,000-yard season heading into 2018. That changed in a big way this year. Adams racked up 1,386 yards (seventh-most in the NFL) and he finished second in touchdown catches with 13. The man simply gets open, as Adams’ 1,242 receiving yards with a step or more of separation were the most in the NFL. The former seventh-round pick with only 49 carries a season ago delivered on the preseason hype. His 3.4 yards after contact per attempt was the second-best figure in the league, while his 45 broken tackles led the league. He carried a run game that had a run-blocking unit that ranked only 22nd this season. Moton was integral to keeping together an offensive line that very easily could have collapsed after losing both starting tackles in the preseason. The second-year player out of Western Michigan played all of 70 snaps as a rookie before 1,054 this season. Moton finished with the 15th best pass-blocking efficiency among tackles. While many of the guys on this list are within their first couple years in the NFL, Smith took until year four to put it all together. It was worth the wait though, as Smith finished 11th among edge defenders in pass-rushing grade in his contract year. 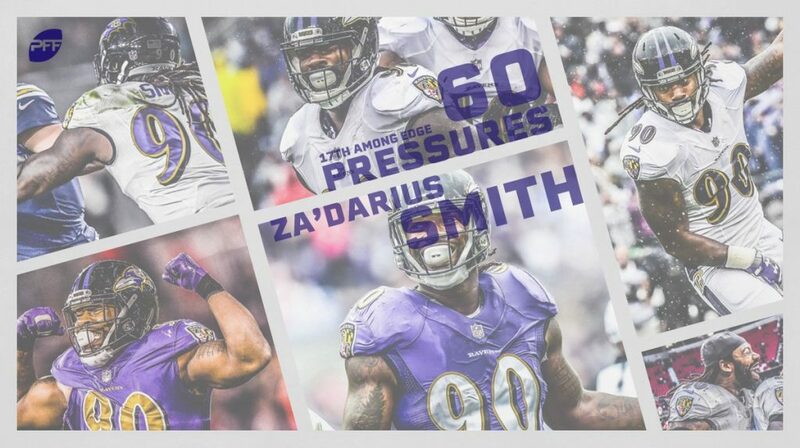 His 60 pressures this season were 20 more than he had a season ago.